Mason Hatton, center, of Fort Lewis College catches a pass while playing New Mexico Highlands University on Friday night at the Durango High School football field. The Skyhawks lost the season opener 45-31. 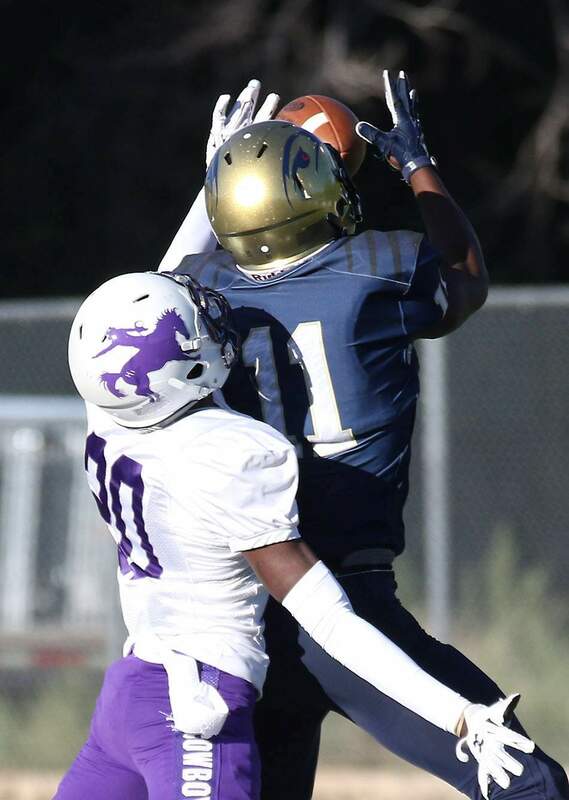 Ta’jon Mondy-Smith of Fort Lewis goes up for a reception against New Mexico Highlands University on Friday night. 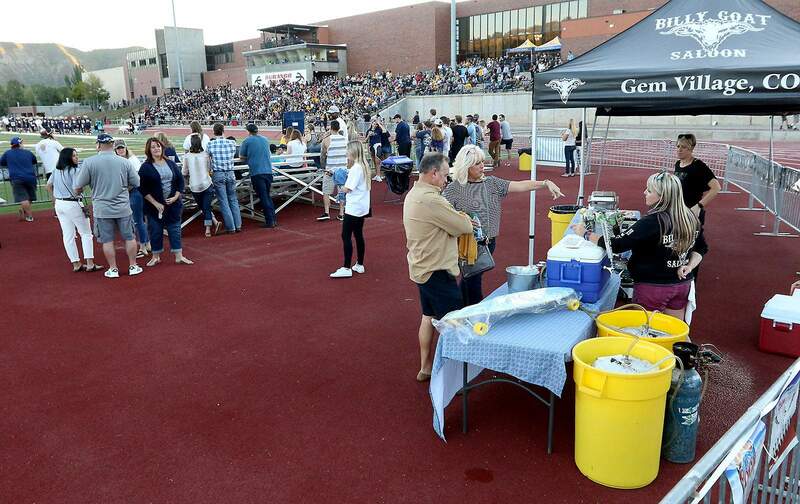 The stands were filled as Fort Lewis College played New Mexico Highlands on Friday night on the Durango High School football field. Quarterback Jake Lowry, left, of Fort Lewis College and teammate Ta’jon Mondy-Smith celebrate a touchdown while playing University of New Mexico Highlands on Friday night on the Durango High School football field. 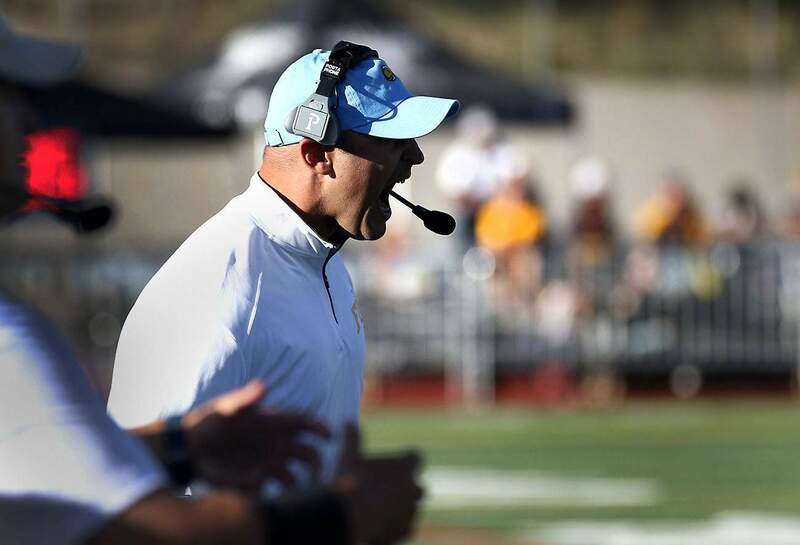 Joe Morris head coach of the Fort Lewis College football team yells out instructions during the New Mexico Highlands game on Friday night on the Durango High School football field. Quarterback Jake Lowry of Fort Lewis College throws the ball downfield while playing New Mexico Highlands on Friday night on the Durango High School football field. 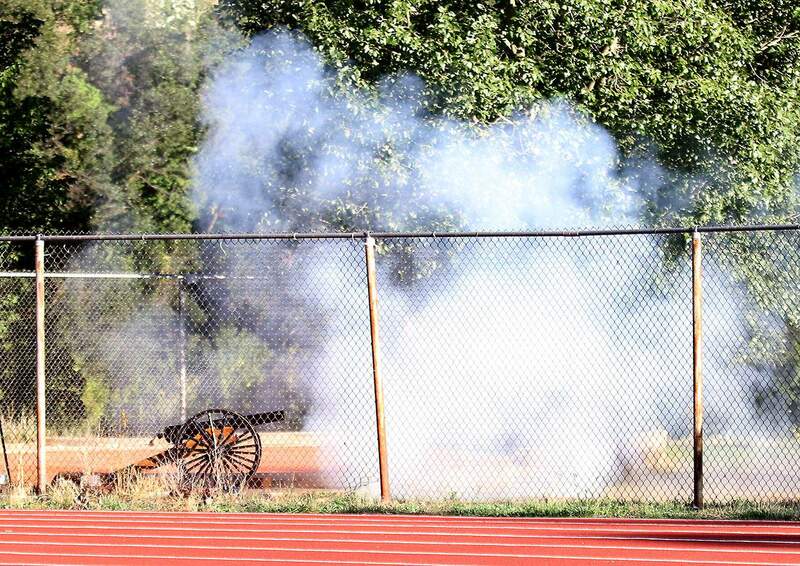 The Fort Lewis College canon crew had the fun of firing the canon during the University of New Mexico Highlands game on Friday night on the Durango High School football field. 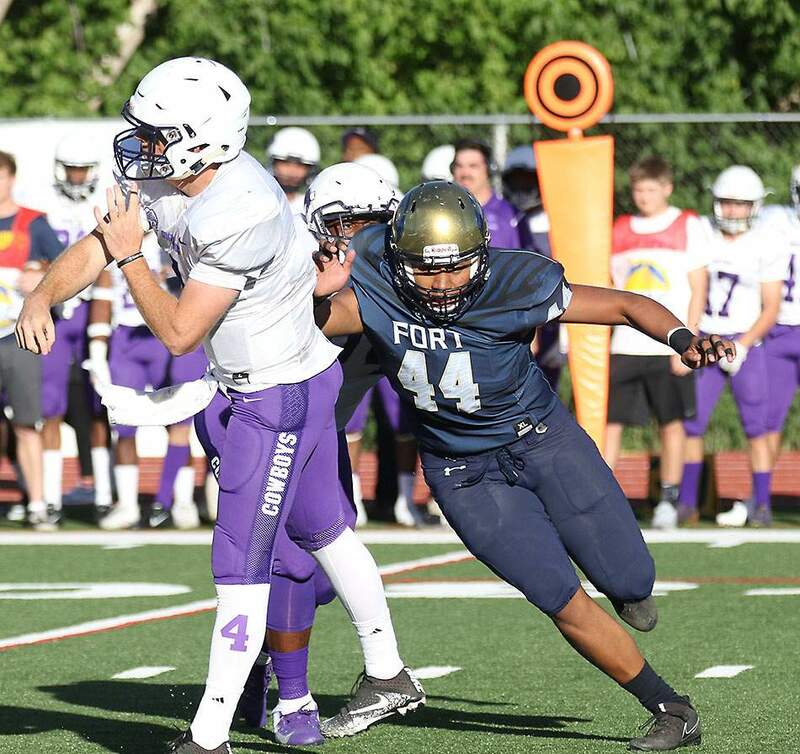 Joshua Cuellar of Fort Lewis College played hard against the New Mexico Highlands on Friday night on the Durango High School football field. 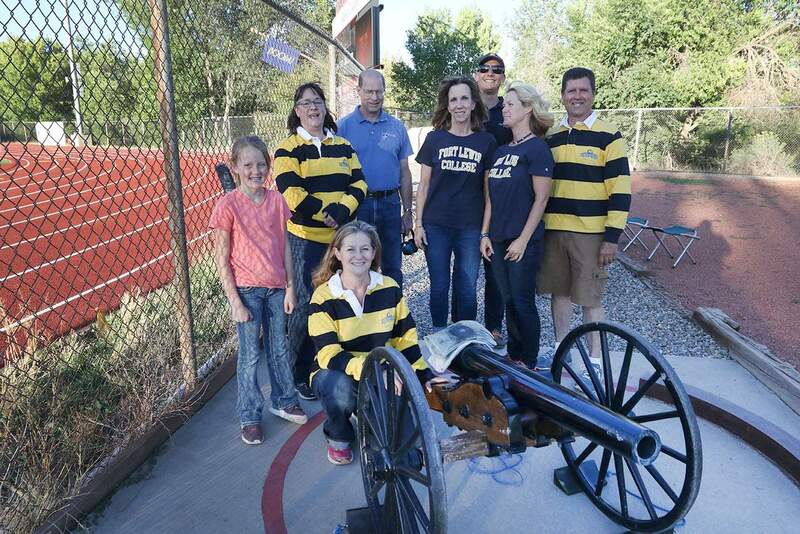 The Fort Lewis College canon crew had the fun of firing the canon during the New Mexico Highlands game on Friday night on the Durango High School football field. Cam Thierry of Fort Lewis College breaks our a pass while playing New Mexico Highlands on Friday night on the Durango High School football field. 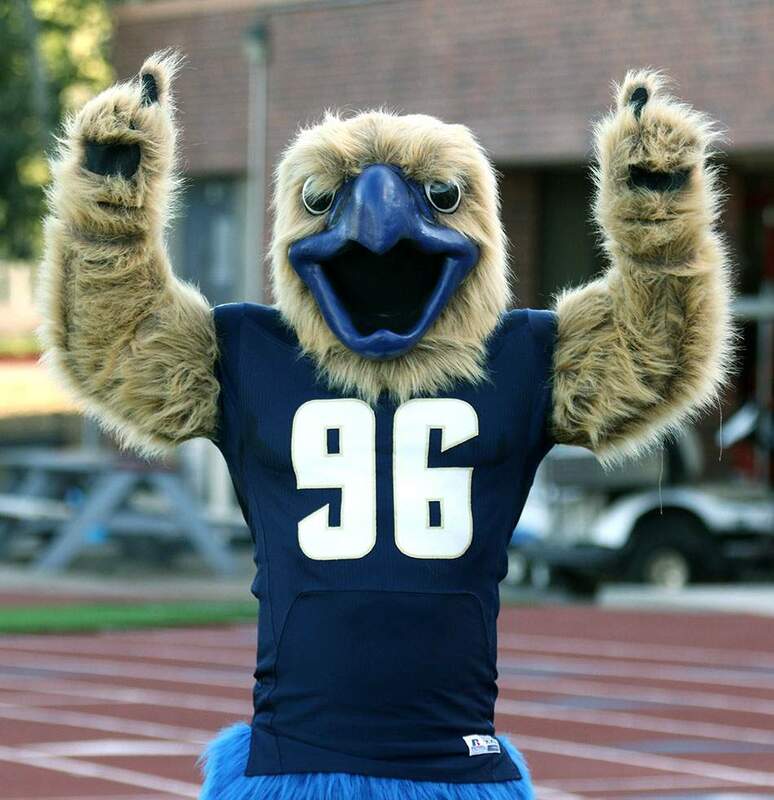 Skylar of Fort Lewis College pumped up the fans during the New Mexico Highlands game on Friday night on the Durango High School football field. 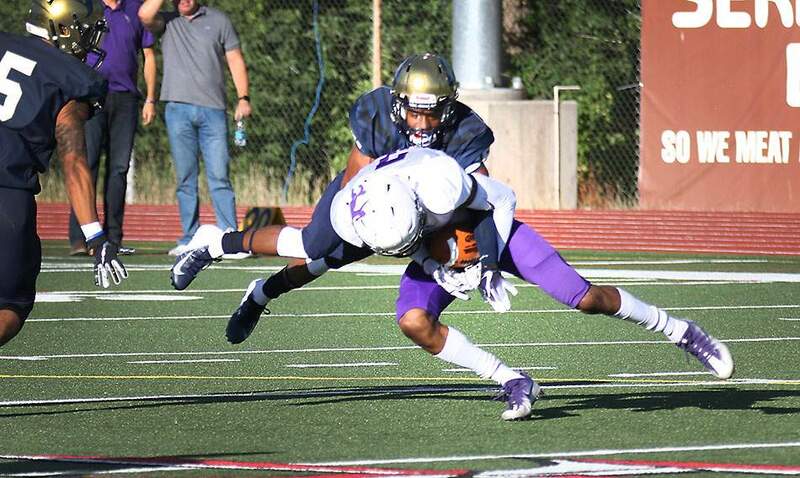 A 99-yard touchdown drive brought fans at Durango High School’s stadium to their feet. But that was about all the Fort Lewis College Skyhawks gave the crowd to cheer for Friday night. FLC took an early 7-0 lead and had the game tied at 14 with 9 minutes, 34 seconds to go in the first half, but New Mexico Highlands’ new-look offense sliced the Skyhawks’ usually potent defense to take a 28-14 lead at halftime. The Cowboys continued the onslaught in the second half en route to a 45-31 victory in the season-opening game played under the lights at Durango High School. The game was meant to get fans in the Durango community involved with the long-struggling FLC football team. 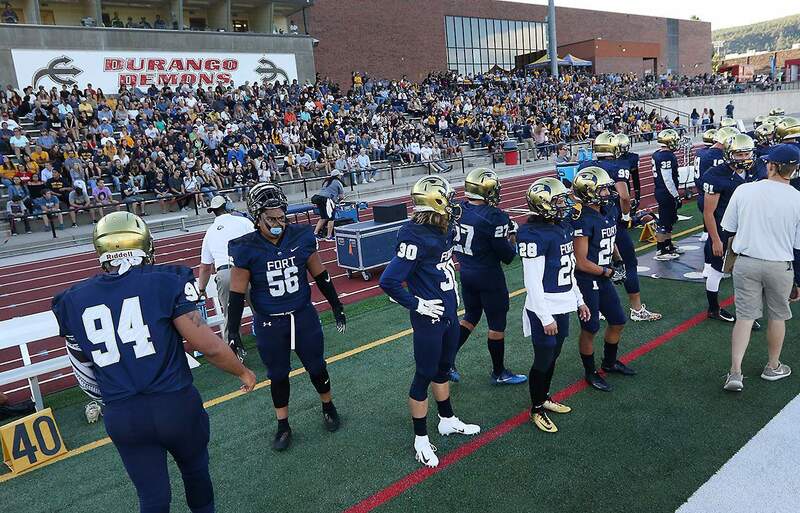 Fans packed the stadium, but the Skyhawks were unable to come up with a fourth consecutive win against the Cowboys in the Rocky Mountain Athletic Conference opener. The defense appeared a bit too pumped up in the opening half with the big-game environment, but FLC second-year head coach Joe Morris said that wasn’t the case. 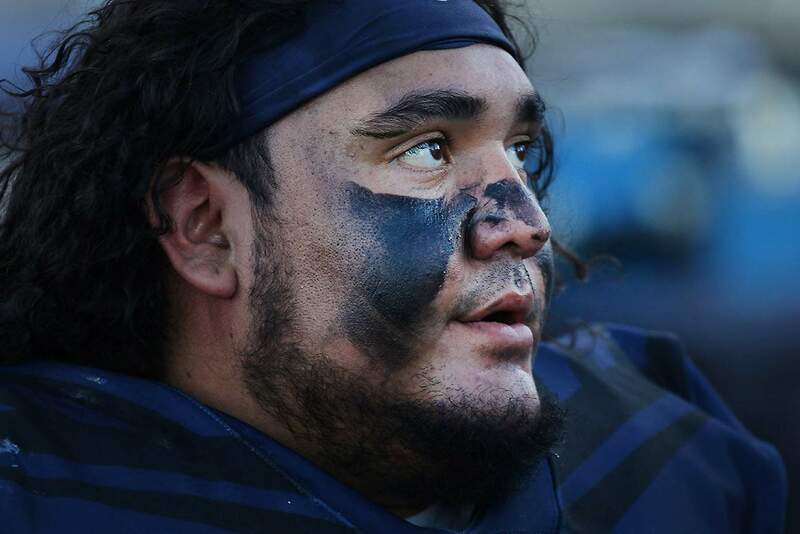 FLC was outscored 31-10 in the second and third quarters, and that was the difference. 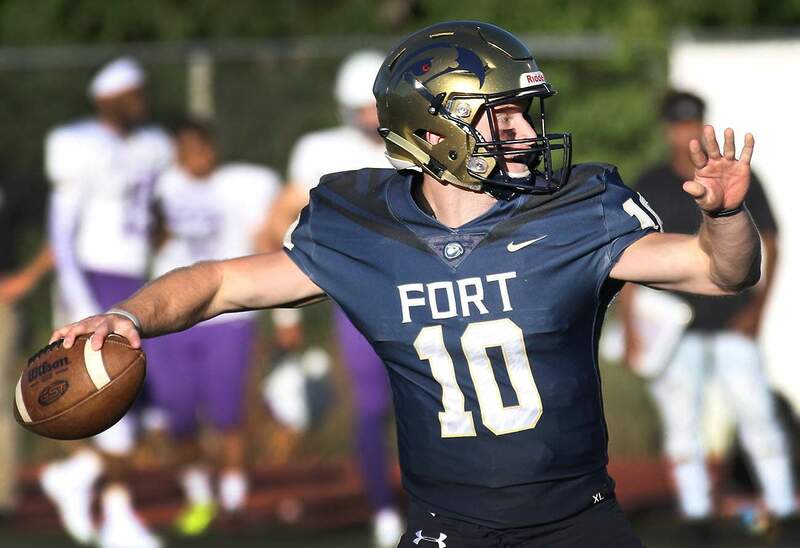 Field position also was critical, as the Cowboys started at their own 40-yard-line or better on eight of 15 possessions, including three times in Fort Lewis territory. 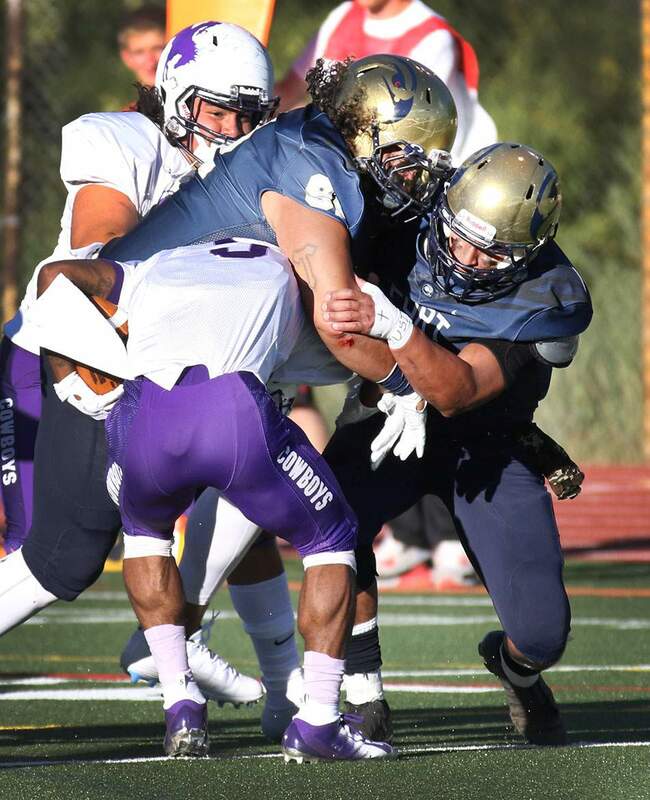 Fort Lewis College defense struggled against the running game of New Mexico Highlands University on Friday night. Devon Henderson had two kickoff returns for 99 yards for Highlands, while C.J. Waite had one for 55 yards. Diego Elebario also had two punt returns, one of which went for 16 yards. FLC’s defense was burned by the Cowboys’ offense. Danny Cameron finished 14-of-21 passing for 246 yards, four touchdowns and one interception. D.J. McFadden hauled in five passes for 108 yards and two touchdowns. Dione Alston never found the end zone, but he set up three Highlands touchdowns with big runs. He finished with 119 rushing yards on 13 carries. Elijah Boyd found the end zone twice on goal-line runs, as he finished with 43 yards. FLC had more total offense than Highlands, with 549 total yards. The Skyhawks also ran 21 more plays, but three turnovers via interception were costly. Brayden Lucero of Fort Lewis College looks for an opening upfield while playing University of New Mexico Highlands on Friday night on the Durango High School football field. 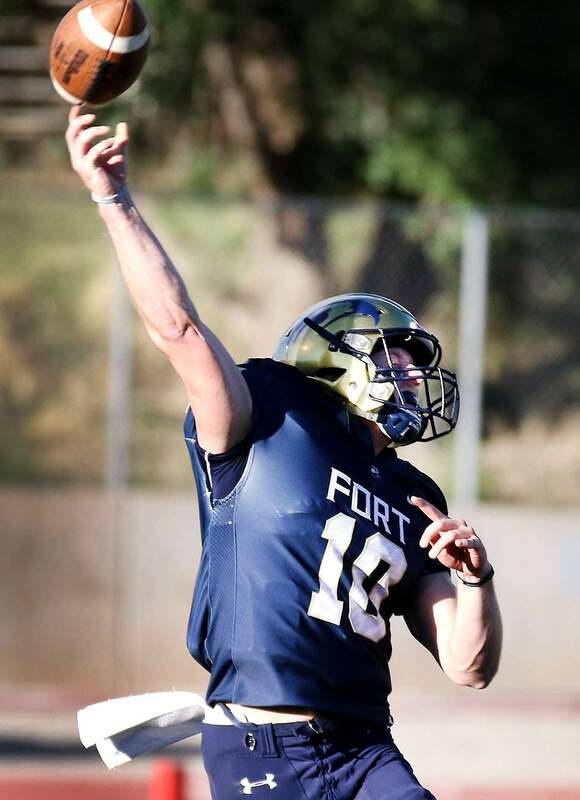 FLC sophomore quarterback Jake Lowry was 23-of-46 passing for 324 yards, two touchdowns and the three picks. He also ran for a team-high 136 yards and two touchdowns. 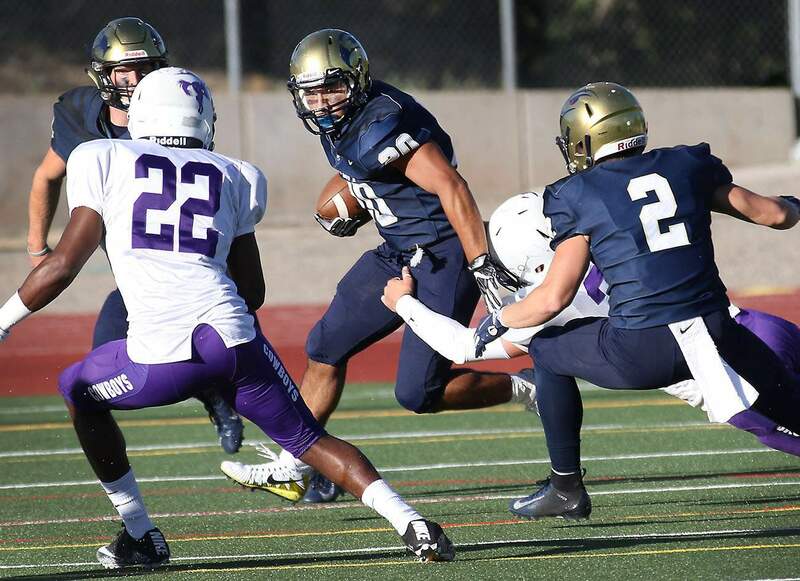 Brayden Lucero rushed for 90 yards on 23 carries. FLC wide receiver Mason Hatton had a big second half with seven catches for 68 yards. It was the big plays from Tajon Mondy-Smith that helped the FLC offense strike, as he had 165 yards and two touchdowns on five receptions. After the teams exchanged punts on their first possessions of the game, FLC took over on its 1-yard-line. A defensive holding, solid runs from Lucero and then a 49-yard pass from Lowry to Mondy-Smith gave the Skyhawks first down on the Cowboys’ 10-yard line. One play later, Lowry was in the end zone on a 10-yard run. The Cowboys answered with a big kickoff return from Henderson. He looked like he would be brought down to the turf by a swarm of Skyhawks tacklers, but he kept his knees off the ground and spun out to return the kick to the FLC 33-yard line. A taunting penalty on FLC gave the Cowboys first-and-goal, and a screen pass from Cameron to Jason Aguirre went for a 3-yard touchdown for New Mexico Highlands to tie the game at 7-7 with 3:43 to go in the first quarter. Lowry was intercepted on the next FLC drive. His wide receiver fell down in the middle of the field, and Highlands’ Caleb Glennon was there to intercept the pass on the Highlands’ 12-yard line. The Cowboys turned the turnover into seven points, and Cameron hit McFadden with a 30-yard pass inside the FLC 5-yard-line. Boyd scored moments later on a 2-yard run to give the Cowboys a 14-7 lead. Lowry broke a 52-yard touchdown run on the next FLC drive to tie the game. But the FLC bench was flagged for unsportsmanlike conduct celebrating the score, and the Skyhawks had to kick off from their own 20. That helped the Cowboys with field position, as they took over on the 50-yard-line for their next drive. After a few big runs from Alston, who continually burned the Skyhawks’ over-pursuing defense off the edge with cutback runs, the Cowboys scored on a triple-option pass from Cameron to Henderson. The 9-yard score gave Highlands a 21-14 lead with 7:24 to go in the first half. “We established the run game early and thought play-action might work a bit, and we did that,” Cameron said. FLC was forced to a quick punt on its next possession. With 5:16 to go in the half, the Cowboys mounted a strong 80-yard drive. A big pass play from Cameron to 280-pound tight end Darrell McIntyre on fourth-and-3 from the FLC 34-yard line gave the Cowboys the ball inside the FLC 10-yard-line, and Highlands punched it into the end zone on a 2-yard run by Boyd. Down 28-14 with 1:52 to work, FLC tried to get on the board before halftime, but a 50-yard field goal try by freshman kicker Hogan Keasler was 20 yards short. Tim Paogofie of Fort Lewis College closes in on the New Mexico Highlands quarterback on Friday night on the Durango High School football field. Highlands returned the second-half kickoff across midfield, but Dre Cortez gave the Skyhawks’ bench and fans some life with an interception. He returned it across the Highlands 40-yard-line, but a personal foul behind the play on FLC backed the Skyhawks inside their own 10, and they went on to punt. On FLC’s next drive, Lowry hit a big pass deep into Highlands territory. As Mondy-Smith got up from the catch, he taunted a Highlands defensive back and drew a 15-yard penalty. Moments later, Lowry was pressured and threw up an ill-advised pass that was easily intercepted by Malik Brown, who camped under the ball before he returned it 26 yards to the Highlands 46-yard-line. After a 28-yard Alston run to the FLC 24, Cameron hit McFadden on a 24-yard touchdown pass that gave Highlands a commanding 35-14 lead in the third quarter. FLC mounted a big drive and needed a touchdown, but the drive stalled on the 3-yard-line and the Skyhawks settled for 21-yard field goal from Keasler that cut the deficit to 35-17. 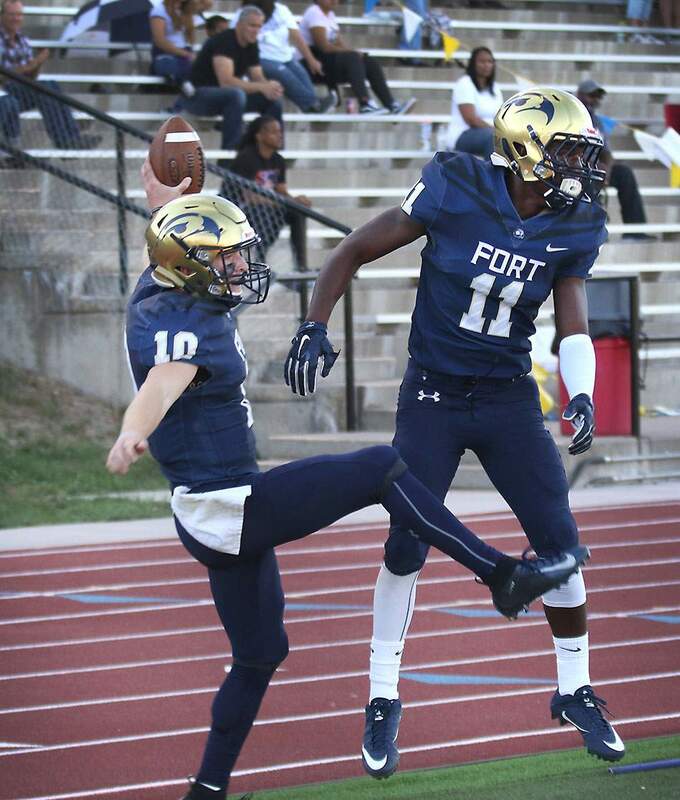 Alston helped Highlands march right back down the field, and the Cowboys added a 25-yard field goal from Israel Farfan to take a 38-17 lead with five seconds to play in the third quarter. FLC did make it interesting in the fourth. Lowry hit Lucero with a 35-yard pass and then followed with a 38-yard scoring strike to Mondy-Smith to make it a two-score game with 14:19 to play. But Cameron answered one more time with another strike to McFadden, who barely got one foot in bounds on the far sideline to complete a 22-yard touchdown. That gave Highlands a 45-24 advantage. “D.J. made a couple great plays to get his feet down on some of those,” Cameron said. Lowry dialed up one more 35-yard touchdown pass to Mondy-Smith with 11:30 to play to cap a six-play, 79-yard drive, but FLC’s offense would stall on the Highlands 4-yard line on its next possession, and the turnover on downs ended the Skyhawks’ hopes of a comeback. 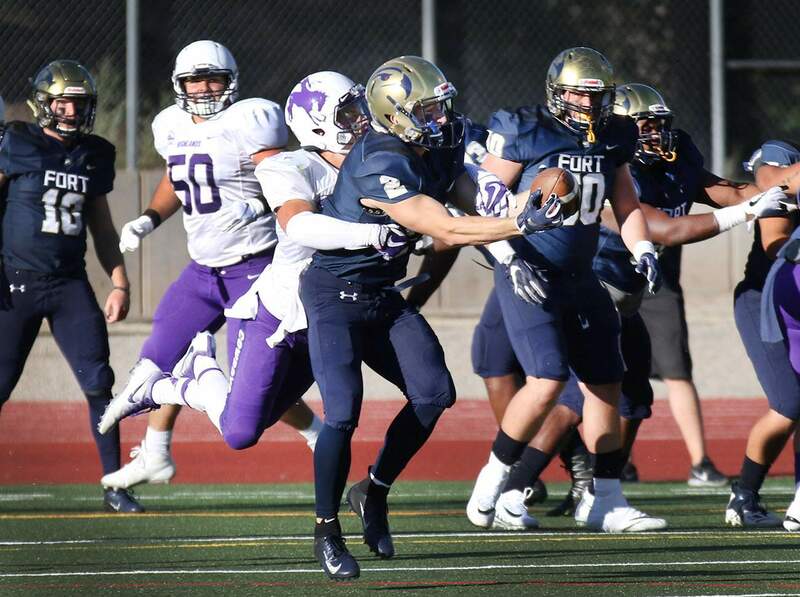 FLC will hit the road for its next two games, beginning with a trip next Saturday to Dixie State in Utah.